Let spring shine in with our plentiful projects, furniture revamps and bakes from the likes of Mary Berry and Biscuiteers. We've got plenty of Mother's Day makes to try, including candles, soap, a knitted bedspread and we turn photos into keepsakes using paper and fabric. 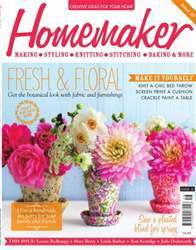 Plus, upcyclers will love our crackle paint how-to, as well as a patchwork chair makeover and a Roman blind masterclass. This month also marks the start of a new columnist, the wonderful Julie Dodsworth. Every issue she will impart her creative wisdom from the comfort of her eclectic narrow boat, Calamity Jane, along with an inspirational project centred around the seasons. And finally, Louise Redknapp caps off this issue and tells us exactly what her home means to her.